If there were to be a race to elect Jersey’s most famous daughters it is likely that Emilie Charlotte Le Breton (otherwise Lillie Langtry) would win fairly comfortably. But keeping her honest and maybe taking the other podium places would be sisters Julia and Harriet Westaway. The Westaways seared across the Island’s firmament during the 19th century and whilst Julia, the last to live in Jersey died in 1901 their legacy lives on to the present time. 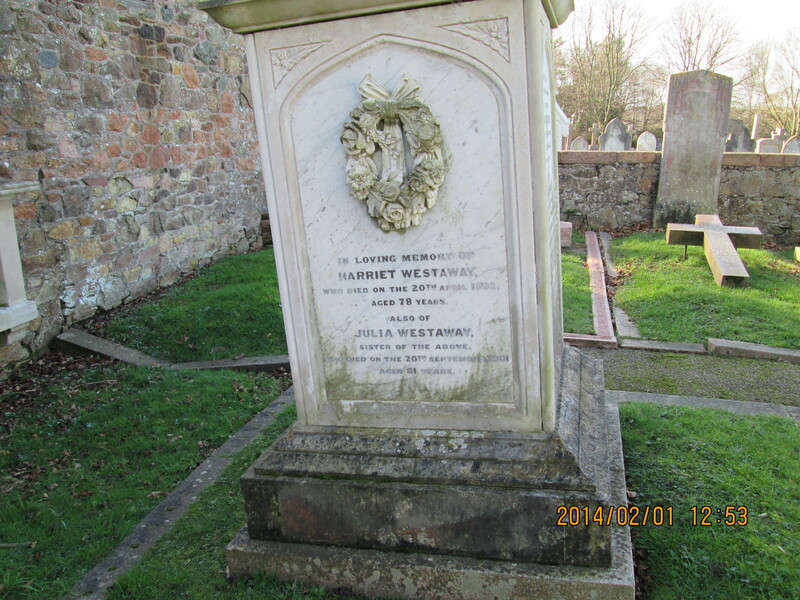 Nathaniel Westaway was a master builder and was prominent in the early part of the century when Jersey was experiencing great expansion and a trading boom. He and his wife Ann had five children but with only John, Harriet and Julia reaching adulthood. When Nathaniel died in 1852 his considerable wealth was split between his three children. An unfortunate disagreement occurred when John, taking it upon himself to administer his sisters’ investments, sought to charge them for so doing. Harriet and Julia refused feeling John’s interference quite unnecessary. Astonishingly things came to such a pass in 1861 that John enforced the debt and, refusing to back down, the sisters were committed to the debtors’ wing at Newgate Street Prison. John, in a mounting rage, committed the sisters to ‘short commons’, a contribution barely keeping them alive. At last Harriet became so ill the sisters had to pay the debt. Harriet re-wrote her will totally in favour of Julia who, in turn, left all her possessions to various charitable trusts and institutions. Harriet died in 1892 and Julia in 1901. John had died in heroic circumstances (see below) years earlier but now his grandson John stepped in to contest the will saying Julia had been of unsound mind. Jersey’s Royal Court upheld the appeal. Happily the Privy Council thought differently, overturned the appeal and Julia’s fortune was distributed according to her wishes. Most notably the Westaway Trust has done sterling work in the years since by providing footwear to children. And though the need is now far less the Trust is still carrying out Julia’s wishes. Many of the buildings constructed by Nathaniel are still a part of the St Helier townscape including the family home at St Saviour’s Crescent. 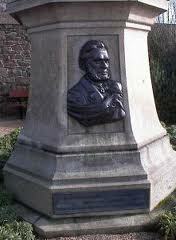 I am including two photographs from St Saviour’s Churchyard. 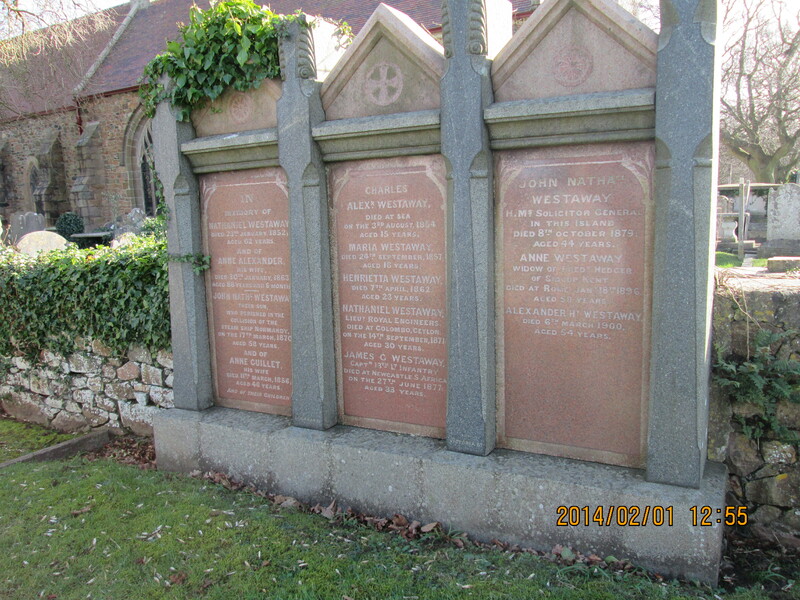 The simple memorial is to Nathaniel and Ann together with Harriet and Julia. The large, three-panelled memorial commemorates the wider Westaway family and pointedly omits the two ‘black sheep’ who did so much for their island home. Brother John’s reputation was saved by his heroic conduct on the night of the sinking of the steam packet Normandy on March 17th 1870. A very interesting story! Thank you for sharing it. I don’t think one heroic act makes up for a lifetime of inexcusable bullying of his sisters, who he should have been protecting rather than hounding and persecuting. Hello Naomi. It was extraordinary indeed. John was appalled he wasn’t left everything by his father, as was usual then. But to force his genteel sisters to present themselves to prison – then, on their release, to have them sit at the roadside awaiting transport, too weak to walk… But then he gave his life saving others. Not an ordinary guy! Definitely not, but I’d take a nice ordinary guy over an extraordinary cruel jerk any day. What a wicked brother – almost sounds like the stuff of fairy tales – and the fact that the trust is still upholding the wishes of Julia shows that goodness always triumphs over evil in the end – which is pretty much the moral of most fairy tales. Hi Jenny. Yes, and then for the nephew to contest the will, no doubt egged on by the family, just seems to compound the villainy. Fair play to the present-day Westaway family in the UK who, I understand, broadly agree with Daff Noel’s portrayal in her book. This just goes to show truth is stranger (and far more interesting) than fiction. John sounds like a greedy cad and I find it amazing that he put his sisters through such torture for money. But unfortunately times haven’t changed much and a friend of mine is now going through a similar (although not so draconian) torture with her brother over the father’s will. Very interesting indeed. Hiya Dianne! Indeed money and wealth often bring out the worst in people. This was an age where the female children wouldn’t have expected to share in an inheritance and, if unmarried, would probably have had an allowance of sorts from John. This thwarted sense of entitlement seems to have turned him bitter. I’m quite pleased that he was ultimately deemed a hero by sacrificing his life for others. Fascinating bit of local yore. Amazing what can happen within a family when it comes to an inheritance. Glad Julia’s wishes were honoured in the end. Hi Francis. A remarkable story indeed. I doubt the family imagined that their internecine disagreements would have people writing books and blogs about them so many years later. And if the Privy Council had ruled otherwise then the story would never have been written. Wow, that’s some pretty modern-sounding family financial drama for the nineteenth century! Hi Janna, yes it would make an excellent TV series wouldn’t it? Well, the apple certainly didn’t fall far from the tree. I hope some where along the family line, the evil ways were exterminated. It’s sad what greed can do to a family. I agree, this would make an excellent TV series. It’s far more interesting than the rubbish that’s on TV now. Hello Jill. Yes I can’t imagine nursing that sort of hate against one’s own family. But I suppose it wasn’t the first will, or the last, to be contested with the wealth on the point of leaving the family. After reading Daff’s book I immediately shot off around St Helier and St Saviour looking at all the Westaway landmarks that I’d been walking past obliviously for years. That’s the great thing about reading, it opens our eyes to the world around us. All the money in the world is no compensation for losing one`s family. They were different times back then of course, and with different ideas as to the capability of women in managing their own affairs. Yes, always sad when rifts appear between strong-willed family members. How much more satisfactory to find compromise. It was never going to happen here. 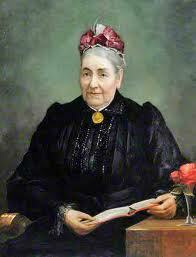 Fascinating local history – women certainly could be treated as lesser beings. The family memorial is also interesting – so many died so young- it cannot have been a ‘happy’ family. Loved this post – thanks! Thank you SV. Yes I doubt if Nathaniel, who seems to have been a lovely man, guessed what a division his decision would produce. It was fascinating for me to go and gawp at the place where John lived with his family in St Helier – right in the town centre, as well as the big house which Nathaniel built for his family and where he, his wife and daughters all eventually died. I’m a descendent of the horrible Johns of Jersey. The grandson must have been my grandfather Ralphs first cousin. The family legend as I have heard it is that Ralph (Hedger) was somehow manipulated into helping to finance the contesting of the will, and lost a lot of money in the process. I have never been sure quite what the truth is. From what little I know about my grandfather he was not at all nasty but was somewhat impressionable and might well have been somehow “pushed” by a rather more forceful cousin. Hello Tom! Welcome, and thank you so much for your input. Very interesting to hear about the financing of the Royal Court action and it must have come as a great blow to that side of the family when the Privy Council verdict came through. I would dearly love to read the whole story from someone with a different perspective. Daff Noel’s research included (I understand) information supplied by the present-day family in England. Though it’s an objective account it inevitably paints John and that branch of the family in an unfavourable light. Maybe someone will ride to their rescue one day! I’m actually pleased that history also tells of John’s heroic actions on the night he died. John’s marital home, Surrey Lodge, is one of those town buildings that remain intact and in good shape. Thank you for your comments and best wishes. What a fascinating story! Inherited wealth has the potential to rip families apart. It’s so sad. Thanks AMB. You couldn’t have made it up could you? Hello Michael and I’m delighted to hear from another descendant of the Jersey Westaways. Indeed brother John seems to have sullied the family name, though – as I’ve commented before – I’d like it if someone could state the case for his defence 🙂 But it remains one of Jersey’s most remarkable and enduring stories. Best wishes and yes indeed, maybe you’ll visit us one day. Mr McCarthy; Thanks for the reply. There is no defence for such a character. I have visited England on two occasions and have thoroughly enjoyed the hospitality and beautiful environs of your lovely country. The people are super! Perhaps not all English people Michael but thank you for the compliment. Jersey is not a part of England (or the United Kingdom) of course and is self-administering. It relies on the UK in matters of defence however, and – as we see in the Westaway court action – it uses the Privy Council (now the Supreme Court) as the court of final appeal. Fascinating story. Hopefully things are slowly improving for women most places. Thanks EQ. Yes, hopefully the world’s evolved a little in that respect.